It’s Good Friday, 2008. Lea and I are together, and we pray thankfully every single day that we have been given the privilege to be together. 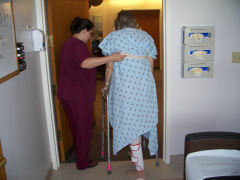 Lea continues to make good progress in recovering from her time in “the hospital” . . . in Meriden and Hartford, Connecticut, Noblesville, Indiana and Kealakekua, Hawaii. During the past two and a half years there have been some very difficult times involved in her recovery from emotional, mental and physical challenges, but our Lord, God, has been with us every step of the way. We have never felt closer to Him, and pray each day that He will direct us in walking the path He has chosen for us. Since the end of last year I’ve been following a little baby’s trials in trying to recover from a congenital diaphragmatic hernia, a defect or hole in the diaphragm that allows the intestine to squash the lungs and prevent them from developing properly. Only five pounds five ounces at birth, the hole in Anna’s diaphragm was quickly discovered, and she was transferred to Indianapolis’ Riley Children’s Hospital for treatment. She is still there today, and is preparing to undergo another surgery today. 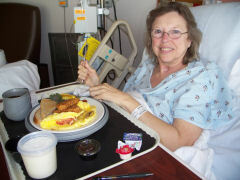 She has a journal blog at http://www.caringbridge.org/visit/annayutzy if you would like to keep up with her progress. I have experienced many floods of emotion as I follow the ups and downs she and her extended family are experiencing. I have been through most of those same trials during Lea’s treatment and certainly recall the horror and helplessness I felt. It makes me feel certain that the Lord is working through Anna to reach out to all who will listen to help them hear the news of His good and great plan for each of us who have accepted Jesus as our Saviour and the doorway to complete forgiveness of our sins. Praise God! As I read the journal entry posted by her parents this morning, saying that Anna was awaiting this next surgery, and they are hoping it will be a great step to achieving a normal life, I was just flooded by gratitude that our own grandson, now almost five months old, has been such a blessing to us! We have marveled as we have watched his mental capacity and eye-muscle coordination improve as he grows, and just absolutely melt when he gives us a smile. We have praised God so many times for the blessing of this new grandchild, and I try to see in the pictures of Anna that are posted periodically that she, too, is growing in these ways. Each little baby brought into the world is such a wonderful blessing; a heavenly gift that can bring such joy! And, I am humbled that Anna’s grandparents are having to go through a different kind of experience, certainly a more difficult one, and my heart goes out to them. I can empathize with the pain they feel, and know all too well the helplessness one feels. The Caring Bridge blog the hospital provides for Anna is a wonderful means to help loved ones keep up on Anna’s progress, but I also know that it serves as an excellent source of strength and support for her parents and family. In my own case, some of the best support I received came through emails that encouraged me, gave personal testimony, and lifted Lea up in prayer. It seemed to me that I always got just exactly the message I needed for that day, just in time. It was uncanny . . . each of the four times Lea clinically died and was revived, there was a message from God in my email! I hope that I have learned to be more openly appreciative of His works, more expressive of His plan of salvation, and a better witness for the peace one can obtain by turning your life over to God. Hopelessness, I think, may be most evident when you have a loved one in critical care for an extended period of time. There is nothing you can do; you have to trust their caregivers to keep them safe. That’s when you feel totally helpless. They even control when and where you can visit your loved one! We pray that the Lord’s will for Anna is that she be given miraculous healing to help her overcome this problem, and that she be granted a full and healthy life in His service. I pray that He continue the shower of blessings on our extended family, as we share His word; that He will always have His hand in the life of our grandson, just as He has for our delightful teen-age granddaughters, who have already given of themselves to minister for Him on mission trips. What a joy it has been to see seeds planted long ago bear such bountiful fruit! Can you imagine how He feels as He watches us? Glory to God for all things, and may you receive a special blessing today, and each day of this Easter weekend, as you ponder the magnificent gift of life given us by the blood shed on the cross so long ago. And yet, He lives! I hope you saw Him here in this simple, humble posting. God bless! Lea and I shared a wonderful Christmas day with our grandson and his extended family, were able to do a webcam visit with our granddaughters and their parents in Hawaii, and had a joyous day filled with His bounty of gifts, affection, great food, reverence, and carefree light heartedness. Lea is in reasonably good health, it seems, and our quality of life just keeps getting better little by little. And, yet, there was a part of my thoughts that kept drifting to those who were so dear to us, but too far away to be together. I had sent an email containing a link to the video I posted of Lea giving our grandson a bath a few days before Christmas to many of these loved ones, as a way to help them see how well Lea has progressed in the last two years, after miraculously surviving a deadly sudden illness. One of the persons I had sent the link to was one of the nurses who tended her during the 180 days she was in Hartford Hospital. This particular nurse was one of the special ones to us. . . he was the first nurse who took Lea outside after four months in the hospital. It was cold in Hartford. Lea was still on life support. She wasn’t strong enough to sit up in a regular wheelchair. She had already had over two dozen surgical procedures. She was on constant tranquilizer and anti-depressent IV drips. Her vital signs had to be continuously monitored. 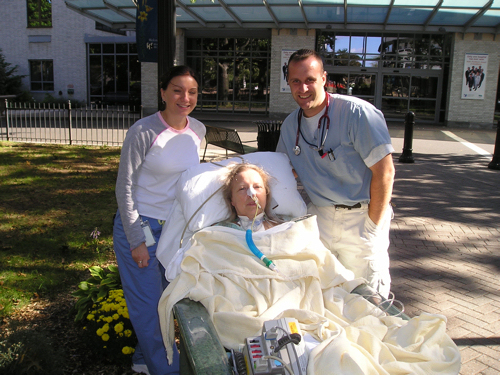 This nurse, Chris, and Danielle, a patient care assistant studying to become a nurse, moved Lea into a cardiac chair (at home we call these recliners), attached remote monitoring gear, portable oxygen and medications, and took her outside the hospital for her first breath of fresh air in months. The hospital has a nice garden area with a gazebo that worked perfectly for this little outing, and I snapped this photo on our way to the garden. Needless to say, Chris’ willingness to take her outside was an additional burden for him during already difficult work days, and our appreciation for this, and many other kindnesses he bestowed upon us, knows no bounds. Chris, by the way, is also in the reserves, and has been called to active duty a number of times. Shortly after this trip outside, he was called to active duty to assist with medical support, as a flight nurse, during hurricane Katrina. When he returned to work at Hartford Hospital, he continued caring for Lea as though nothing special had happened. He even stopped in to check on her after she had been moved out of the Critical Care Unit. He, and fiance Amanda, drove us to the airport to fly home, so we wouldn’t have to take a taxi. He will always hold a special place in our hearts. And, my thoughts were on him during this Christmas day, because I had gotten an email from him Christmas eve, stating that he was back on active duty; this time in Germany, where his medical team flew into Iraq and Afghanistan to tend injured soldiers being flown back for treatment. I was humbled by his letter, and asked for special prayer for him and his unit at the Christmas eve service at church. I was also a bit ashamed that I get so caught up in my own day to day concerns I forget what others are going through. “Merry Christmas to all from cold and foggy Ramstein, Germany. We have had over a week to get settled into our routines and get our lives as normal as you can. Much to my surprise there seems to be a regular flight schedule which allows for a day of recovery, a day of standby alert and then a mission. We fly every 3rd day and get a true day off once every 10 days or so. My crew and I have been to Balad, Iraq twice already and our flight time is quickly adding up. We obviously land in total darkness and try to minimize our ground time which I am all for. While I haven’t been officially tested for it I think I am extremely allergic to mortars, shrapnel and anything that might have missile like characteristics. 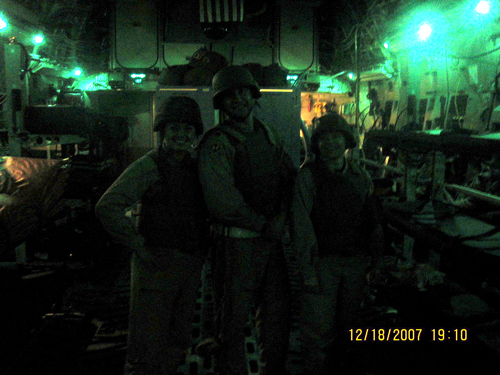 The attached picture is three of us from Westover shortly after we entered Iraq on our first mission. It’s hard to see with the lighting but you have to take what you can get. 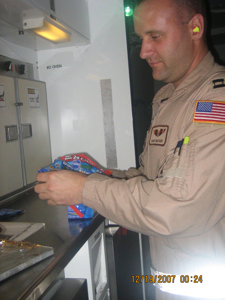 The other picture is of me cooking up some cookies shortly before we landed back in Ramstein. I think they were pretty tasty but it is hard to mess it up when they are already made for you. Our unit uses donations to purchase sweets for us to cook up when we get a chance and after seeing how much of a hit they were it is totally worth it. The days are extremely long and depending on mission location the duty time can easily approach 24 hours long. The crew I am with, especially the enlisted are truly awesome. On our last mission our patient load almost doubled, we had 3 vented patients added at the last minute and had to fly with equipment that I haven’t seen since flight school over 4 years ago. 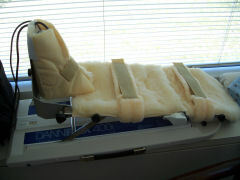 Without missing a beat the aircraft was totally re-configured and within 30 minutes we were ready to accept patients. Not bad considering that for most of them that was only their 2nd or 3rd live mission. Our holiday today consisted of shopping earlier and dinner at Chili’s. We will try not to over do it. Christmas Eve and Christmas are huge over hear and there is nothing open off base. With another mission tomorrow nobody was up for a late night anyway. Our Christmas will be spent in the festive colors of tan and black, flying for over 16 hours and getting back sometime the following day. In all honesty if I have to be away for the holiday there is nothing more rewarding than flying wounded troops home on Christmas. Needless to say, Chris’ letter touched me, and reminded me how self centered we become, even when we think we are reaching out, and consciously seeking His will for our lives. So, I was already sensitized when I went to my email the morning after Christmas and found another email letter from Chris. This one brought reality crashing in, and I felt led to share this with you. Ramstein Air Base, GermanyOur mission was scheduled to leave within 90 minutes and our crew of 7 was sitting in a van waiting anxiously to get the day started and wondering what in the world we could be waiting on. Our mission was to take us to Bagram Afghanistan aboard a KC-135R, a 16 hour day and that is if everything goes according to plan. The earlier we get going the earlier we get back which will be sometime early tomorrow morning if we are lucky. One distinct disadvantage to using this aircraft is that we need a specialized piece of equipment called a K-Loader in order to lift all of our equipment up so we can load it into the aircraft. With the lifter already 30 minutes late we sat and we waited and waited, and… Then going down the middle of the tarmac was not only one lifter but two! It was finally our turn, however the trucks never stopped, they just kept on going. were having all along. I watched the loaders pull up behind a C-17 that had just landed and had parked only a few spaces from where we were. Like clockwork people prepared the aircraft after arrival, chalking the wheels, lowering the ramp, and moving vehicles. 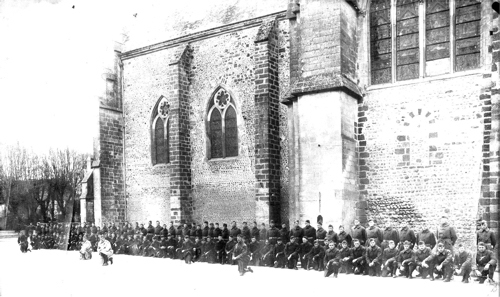 were standing at attention, then they saluted. I now knew why we were waiting. Somewhere back home maybe a few hours before this, a family got the news that no family ever wants to receive; their loved one will not be coming home. loaders we had seen earlier. On it was a single flag draped coffin, a hero heading home. As the small convoy drove the length of the tarmac other vehicles it would pass would come to a complete stop and turn off their lights, those who were working on the ground would stop what they were doing and render the time honored salute given to those on their final voyage home. I am so ashamed of my selfishness! Oh, dear heavenly Father, forgive me my shallowness and self centeredness. Please give peace and comfort to those who are not as richly blessed as You have chosen to make me. Father, my heart goes out to those who have sick and injured loved ones on their minds, and particularly that family that received the horrible news of the loss of their loved one on Christmas Day. I pray for their comfort, Lord, and that You will hold them in the palm of Your loving hand, as they struggle to overcome their grief at this tragic loss. Father, I pray, too, for those You have chosen to be our care givers. Bless them, Lord, as they go about tending to the needs of those sick and injured in their care. Tend to their own hearts and minds, that they might receive gratification from what they do to help others. Guide their hands that they might be steady and true. I pray for a circle of protection to be put around Chris and his team as they continue to be put in harm’s way to help those who need medical attention. 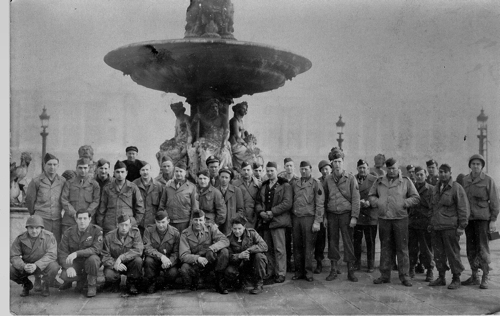 I pray for all our troops, Father, wherever they might be; that You will always be present in their hearts and minds. Bring them home safely to their families to share a glorious day of celebration. Continue to bless this Christmas season, Lord, protect it from those who would diminish its importance. Give each of us the moral strength to stand by, and fight for, the right to publicly declare our gratitude for the sacrifice made by Your son, Jesus Christ, that we might have eternal life. It is in the name of Jesus, my saviour, that I humbly lift up this prayer. Amen! Our family has been SO blessed! And, once again, every one of us was given an opportunity to realize how much we can rely on His benevolence and love. It is when matters are beyond our control that we are brought closer to Him, as we seek His help. He keeps showing us The Path, and we step on it and walk it as long as we need His help, and then begin to stray as soon as the crisis is over. This straying from the path is dangerous, and can bring His discipline down on you and those you love. Take heed! This was another chance to change our hearts and minds and submit to His will. Don’t waste it! Thank You, Father, for delivering Kora. Please place a shield of protection around her and give her comfort as she recovers from this illness. And, Father, please keep Your guiding hand in her daddy’s life as he struggles to help his young family. You know our hearts and our needs, Father, and we pray for Your continued blessings. Amen.